These crisply cut pendants start our week out on the right foot. They’re from California’s Syndee Holt on Instagram. 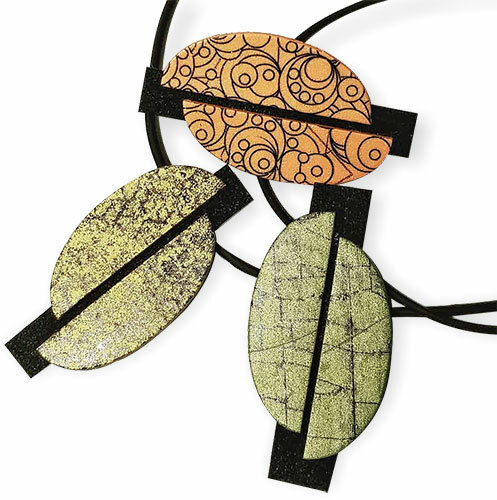 She decorates ovals, cuts them in half, and shifts them slightly up and down on a black bar to make pendants with an architectural air. This makes us feel under control which is a good way to begin a Monday. PCD readers have been clamoring for information about the mysteries of translucent clay. Missouri’s Ginger Davis Allman took the challenge and has written a crystal clear comparison of clays from different manufacturers, in varying thicknesses, and baked at different temperatures (go to the bottom of her page for that revelation). She uncovers a few surprises and gives several helpful tips. It’s a must read and we’re indebted to Ginger for her research. Ginger’s entire site is a good read too – well written, pleasantly organized and a nice place to spend some time. A shout out to Christine Dumont who first passed the link along. Valentines Day is becoming popular in Nepal and for the ladies in the Samunnat project, the holiday has taken on a special significance that Wendy explains in her post. The ladies and the Board are daring to dream as the possibility of a facility for Samunnat becomes a reality – thanks to your donations. CLICK to donate. Can they include a small shopfront to sell their pickles and incense? Could they make space for a little beauty parlour? It’s a big business in the area. Understand that are no botox treatments in Nepali salons! Only henna coloring and eyebrow threading. Here I am getting a lovely mustard oil massage in Kopila’s home! They slathered me in oil from head to toe and let me marinate until morning. The mustard is grown and processed locally. If you’re near Rhode Island, Sandra is scheduled in the Pawtucket Foundry Artists Show starting December 3. And speaking of the holidays, Dayle Doroshow and I have put together an inspirational volume that’s chock full of Dayle’s famous tricks for easing you back into the studio when your muse goes missing. Creative Sparks is full of luscious pictures and powerful tips. Preview and purchase it here. Ontario’s Wendy Orlowski brings us a bit of green and glamor today. 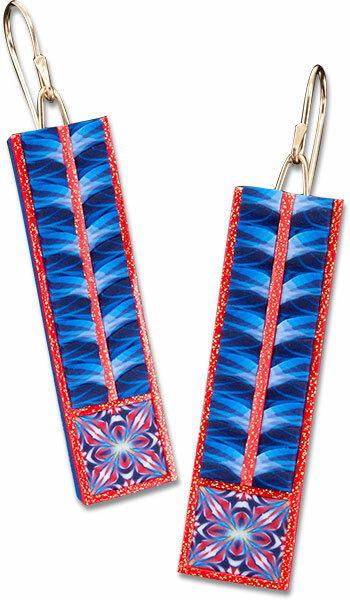 She tagged along on a fashion photo shoot and the results give her new tribal design an added boost. It’s amazing how a good photographer and a young neck can send work to a whole new level. Wendy details the progress of these pieces and demonstrates how she uses grommets. And for those who are tutorial-hungry, there’s a neat little texture tool tip here. My Kemper polymer clay cutters were always running away from me. When I saw someone at a conference with theirs neatly corralled, I decided to do the same. I never thought of showing this efficient helper off. I’ve seen other artists’ beautifully crafted tools (see this early shot of Celie Fago’s) and this one is no beauty. 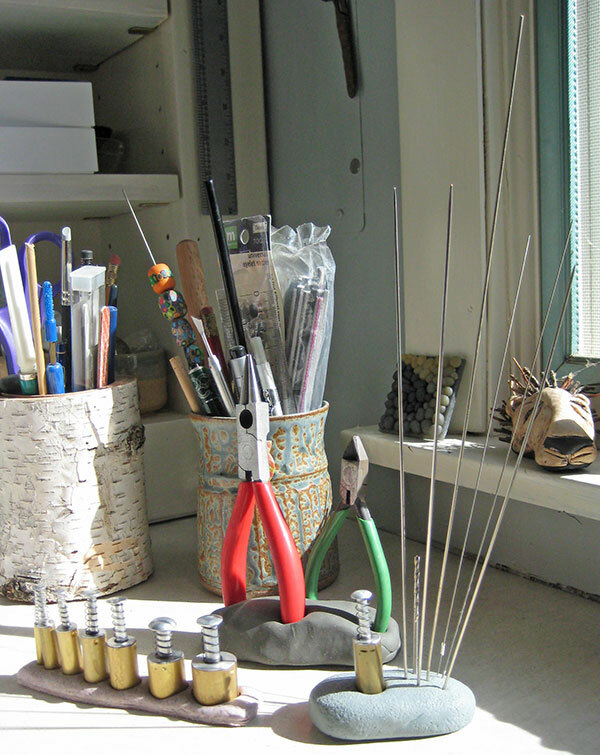 Recent visitors to my studio thought readers might find beauty in its efficiency. I’ve since devised similar helpers for other tools (pictured here) that try to elude me. Roll up some scrap clay, press your must-have-handy tool into it, remove the tool and bake. Voila! A studio assistant! Name that sculpture and win! ToyCyte interviewed polymer clay illustrator Jessica Fortner this week. They’re offering one of her newest furry sculptures to the person who can name the new series. Catch a good read and a chance to win. I resurrected this video shot last year to remind myself to take better care of my best polymer clay tools – my hands. We’re lucky to have many talented masseuses like Klew in our ranks to keep us healthier. For the life of me, I can’t make my thumb joint pop like Klew does on Sarah Shriver. The instruction is good anyway and I’m paying better attention. (Grasshoppers were making that annoying background noise.) Here’s the full-size version. On a sillier note, I made myself a very attractive (and much younger) avatar/manga at this Italian site. Perhaps I should make a cane of it. The site’s in Italian but with a little clicking around, it’s easy to get the hang of it and email the results to yourself. I found it on Samyii’s Flickr site.